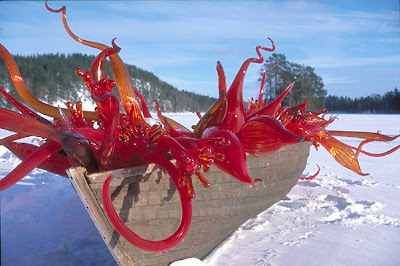 When i look at certain work of American sculptor Dale Chihuly it reminds me of the sea, of sea anemones and jellyfish; beautiful explosions of colour amongst the inky depths. 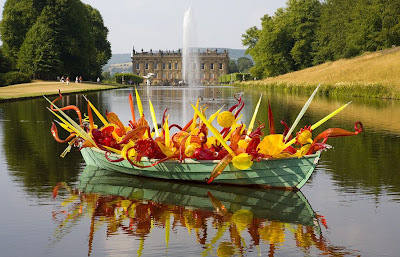 Chihuly works mainly with glass to produce luminous pieces of art. 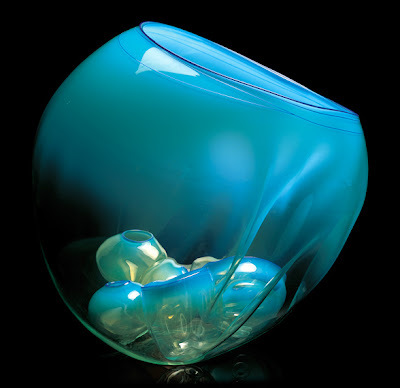 A student of interior design, fine art, sculpture and architecture in the early 1960s; by 1965 he had become captivated by the process of glassblowing. 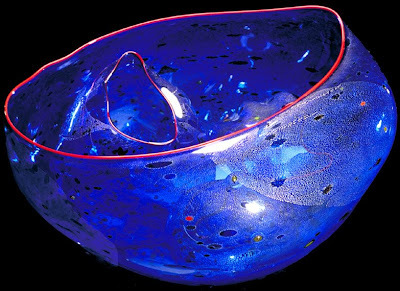 In 1968 he studied glass in Venice, a historical hotbed for the development of glass art. In 1976 whilst in England he was involved in a near fatal automobile accident. He flew through the windshield, sustained serious facial injuries and lost vision in his left eye. He recovered, wore an eye patch and continued to blow glass. Three years later misfortune struck again. 1979 was the year that he dislocated his shoulder in a body surfing accident. This halted his ability to hold the glass blowing pipe and instead of turning his back on it, he decided to hire others to do the physical work for him. (This is something that divides opinion but is not unheard of in the art world- a vast majority of Damien Hirst's physical art work is done by his studio staff). He described it as being able to view the work from more angles and able to anticipate problems faster. 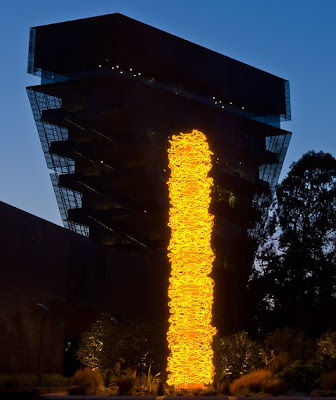 "Once I stepped back, I liked the view"
He has exhibited all over the world and was a co founder of The Pilchuck Glass School in Washington. His life has been filled with events that would have destroyed another person (loss of sight, an accident that rendered him unable to blow glass, 2 lawsuits and a bi-polar diagnosis) but he has risen about it. His work doesn't reflect the darkness that has tinged his life, instead it vibrates with color and life. Thanks, don't know anything about him but will now find out more. 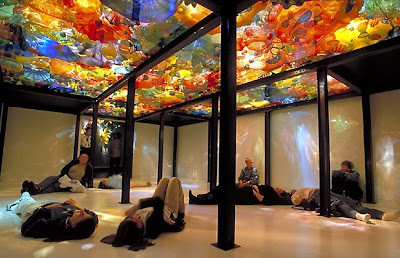 Yep his stuff is beautiful, what i wouldn't give to be able to wake up on a sunny day under a ceiling of his glass work!